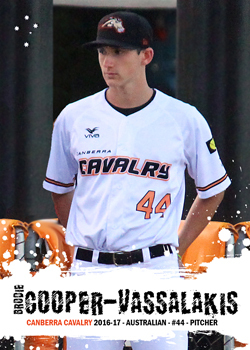 Cooper-Vassalakis is a local Canberran youngster who was a part of the Canberra Cavalry development squad during the 2016-17 ABL season. Despite only being 15 years old at the time he made his ABL debut during that season, becoming the ABL's youngest ever player. Brodie's dad was the ACT Baseball Commissioner responsible for Canberra's bid to join the revamped ABL back in 2010. For abbreviation's sake Brodie's surname often appears to be shortened to just Vassalakis on the ABL website, however he's more than ready to follow in The Hyphen's tradition should he ever make it to the big leagues.